Most MBA programs at the top business schools require 1-3 letters of recommendation. MBA candidates are asked to provide the names of 1-3 people who can serve as their referees and submit a letter of recommendation on their behalf. Ohio State Fisher – The optional letters of recommendation provide the MBA Admissions Committee with further insight into your personality, your character, and your potential for success in the MBA program and beyond. 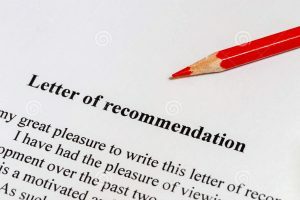 Typically, one of your letters of recommendation should be from a professional context. We encourage you to choose individuals to recommend you who can attest to your scholarship, professional development, leadership potential, and personal character. USC Marshall – “We neither require nor accept letters of recommendation as part of our admissions process”. SMU Cox – “The Cox MBA Admissions Committee no longer requires applicants to submit letters of recommendation. Instead, we ask you to submit the names (with applicable contact information) of two people who could serve as professional references if needed during the review process. The best references are those who know you in a professional capacity, such as current or former supervisors. You should not submit professors or personal references”. Price College of Business, University of Oklahoma – “Letters of Recommendation are optional. Attach letters to the supplementary documents section at the end of the application, or have them sent to oklahomamba@ou.edu”. Neeley School of Business – “As a part of the online application, you will be asked to provide contact information for three individuals who could provide professional recommendations if contacted by the Admissions Committee during the review process. As you decide who to list, please note that we are seeking recommendations from individuals who are familiar with you from a professional setting, as opposed to personal friends or former faculty members. The Admissions Committee will decide which recommenders, if any, will be contacted during the review process. Please note that paper recommendations or letters will not be accepted”. If you are wondering if other business schools will allow you to apply for their MBA without recommendations, we recommend you visit the website of the business school in question and read their requirements for the program to find out.